Shanghai (121.470E 31.229N) was the most important city and largest port in pre-war China, and the fourth largest city in the world, with a population of at least 3 million persons. Built on the Whangpoo River, a tributary of the Yangtze, Shanghai was a small fishing village until it was opened to foreign trade in 1842. The Whangpoo was extensively dredged, and by 1941 it was lined with warehouses and docks for miles along the Bund district. A large part of the city, the International Settlement, enjoyed extraterritorial privileges and was run jointly by the major powers through a ruling council. There were 40,000 foreigners living in the Settlement and its financial institutions were central to the economy of East Asia. There was an airfield at Hungkou (121.335E 31.198N). The city was notorious for opium trafficking and prostitution, and the Chinese police force was heavy infiltrated by the Green Gang (Ch'ing Pang). The Green Gang saw to it that crimes against Westerners were efficiently prosecuted, thus earning a measure of tolerance in the International Settlement, while allowing their members to run riot in the Chinese quarter of the city, the Chapei district. Kuomintang forces under Chiang Kai-shek reached the city in the spring of 1927 against negligible resistance by warlord forces, but Chiang enlisted the Green Gang to help destroy the Communist organization in the city. The Japanese settlement at Shanghai had its own underworld dominated by gangsters who styled themselves after the ronin, the masterless samurai celebrated in Japanese literature. Some Western observers later claimed that the ronin acted as guerrilla forces in support of the Japanese Army in the battles that took place around Shanghai. Japan attacked Shanghai in 1932, and again in 1937. The second battle was a Japanese victory that opened the Yangtze River valley to the Japanese. Shanghai remained in Japanese hands until the final Japanese capitulation in August 1945. First Battle of Shanghai. The 1932 attack was instigated by the same Itagaki Seishiro who had engineered the Mukden Incident that led to the takeover of Manchuria. Itagaki persuaded the assistant military attaché in Shanghai, Major Tanaka Ryukichi, to use secret Army funds to to hire agents provocateurs to stir up trouble in the Chapei district. On 18 January 1932, five of the provocateurs were killed by angry Chinese workers, and the incident quickly escalated to the point where the Japanese Navy put a naval landing force ashore to protect Japanese interests. These clashed with Chinese troops and called for Army reinforcements on 31 January. The mixed brigade of reinforcements found itself up against the Cantonese soldiers of 19 Route Army, primarily 87 and 88 Divisions, who had been trained by German advisers and hated the Japanese. The Japanese Army soon called in 9 Division but, anticipating a short campaign, landed it without its full complement of equipment and supplies. An unimaginative frontal assault led to heavy casualties, but the Army deflected criticism by touting the heroism of three soldiers who purportedly made human bombs of themselves. In a rather darker incident, a battalion commander, Kuga Noboru, who had been wounded and taken prisoner by the Chinese, killed himself to redeem his honor after being exchanged. This set a precedent that would contribute to the savage character of later fighting in China and the Pacific. The First Shanghai Incident ended with a cease-fire on 5 May 1932, after the Japanese suffered some 3000 casualties (700 killed) and inflicted about 12,000 casualties on the Chinese. As part of the agreement, the Chinese withdrew all military forces from the Shanghai area except a gendarmerie, the Shanghai Peace Preservation Corps. It was rumored at the time that this was heavily infiltrated with members of 88 Division, and the SPPC regularly engaged in tactical drills more suitable for a combat force than a police force. Second Battle of Shanghai. The second Japanese attack on Shanghai began on 8 August 1937, when Oyama Isao, a naval officer from the Japanese Special Naval Landing Forces, was shot dead near a Chinese-controlled airport outside Shanghai, along with his driver and an unidentified Chinese dressed as a Kuomintang soldier. The Chinese claimed that Oyama had attempted to force his way onto the airfield; the Japanese claimed that Oyama had been ambushed outside the airport. Again, a relatively minor incident was quickly escalated, and thereafter the Japanese and Chinese fought a full-scale undeclared war in northern and central China. It seems likely that Chiang Kai-shek deliberately provoked the attack in an attempt to force the Western powers to intervene on China's behalf. However, Chang and Halliday (2005) claim in their controversial biography of Mao Tse-tung that the local Chinese commander, Chang Chih-chung, was actually a Communist mole and engineered the incident in order to provoke war between the Kuomintang and the Japanese to the advantage of the Communists. In response to the Oyama incident, Chiang ordered 88 Division back to Shanghai, and the Japanese began landing their own reinforcements on 11 August. According to the head of the Peace Preservation Corps, at around 0900 on 13 August, a group of SNLF soldiers in civilian clothing provoked an outpost of the PPC into firing warning shots, then opened fire on the Chinese. Chang Chih-chung gave a different version, claiming that the Japanese opened fire on Chinese troops near the Commercial Press building at the west edge of "Little Tokyo" (121.471E 31.264N). However, the Japanese claimed that a Chinese machine gunner hidden in the Commercial Press building fired first. Just who fired the first shot will likely never be known, and it seems clear the PPC and the SNLF were both itching for a fight. Sporadic shooting continued throughout the day. The first major engagement of the battle took place at about 1500 on 13 August 1939, around Eight Character Bridge (Bazi Bridge; 121.471E 31.271N). Chinese troops advancing on the bridge met Japanese troops who had just crossed the bridge and were setting up defenses. The Chinese briefly drove the Japanese back, but Japanese warships on the Whangpoo began providing gunfire support to the Japanese troops. The next day, 14 August 1947, "Black Saturday", the Chinese attempted to capture the SNLF headquarters at Hongkou (121.477E 31.269N) with an unimaginative massed frontal assault. The headquarters was heavily fortified and the Japanese were supported by naval artillery, and the Chinese suffered heavy casualties, particularly among officers. Chinese aircraft attempted to bomb Izumo in the Whangpoo River. Met with a wall of antiaircraft fire, the aircraft dropped their bombs wide of their target, instead hitting the wharfs, the Cathay Hotel, the refugee-packed Great World Amusement Center, and the packed crowds on Nanking Road who were seeking refuge in the International Settlement, About 150 civilians were killed near the Cathay Hotel and another 675 were killed at Great World. Chiang ordered the Chinese attack called off, and appointed Feng Yu-hsiang, an old rival, to assume command of the Shanghai forces. On 15 August, 1 Combined Air Group was ordered by 3 Fleet to strike Chinese airfields near Nanking, suffering four aircraft shot down to Chinese fighters. The SNLF were sufficiently hard-pressed that their commander committed his reserves, including his limited numbers of tanks, and the Japanese Navy dispatched an additional 2400 SNLF troops as reinforcements. The Japanese Government also ordered 3 and 11 Divisions to reinforce the SNLF at Shanghai, to operate under the newly activated Shanghai Expeditionary Army. This was commanded by Matsui Iwane, a staunch pan-Asianist and anti-Communist with long experience in China who had met Chiang Kai-shek, but was contemptuous of him for his nominal alliance with the Chinese Communists. Matsui told Sugiyama that the ultimate objective after taking Shanghai should be to take Nanking and overthrow Chiang Kai-shek. Chiang meanwhile ordered his forces to regroup and carry out a more careful attack on the Japanese, Operation IRON FIST. This was to be launched early on 17 August 1937 and to make use of the infiltration tactics used by the Germans in the late stages of the First World War in France. This reflected the influence of nearly 70 German advisers working with the Chinese Army. The objective was to advance through Hangkou to the Whangpoo river, cutting off the Japanese. However, the preparations were observed by Japanese naval aircraft operating off of ships and airstrips on Chongming Island (121.566, 31.641N), giving away surprise, and the Chinese suffered heavy casualties at each road intersection. Nevertheless, the advance was not stopped until it had reached Broadway, the last street before the river, where the Japanese had excellent cover behind the high wall protecting the wharfs. The Chinese found that even 150mm guns could not penetrate the wall or dislodge the Japanese. Chinese tanks committed to the battle piecemeal were wiped out. The Japanese in turn had strong naval artillery support, and that night, reinforcements arrived and brought the Japanese strength up to 6500 troops. The Chinese were forced to withdraw and go over to the defensive. Meanwhile the Japanese suffered heavy losses in the air, including half the medium bombers of 1 Combined Air Group, but after 20 August had wrested almost complete control of the air over Shanghai. A series of raids on Nanking on September 19 force the Chinese to withdraw what little air power remained in the Shanghai area. On 22 August, 3 Division landed at Wusong, at the mouth of the Whangpoo River (121.499E 31.380N), and 11 Division landed at Chuanshakou (121.332E 31.496N), twelve miles (19 km) further up the Yangtze. The Chinese forces around Shanghai were now in danger of being cut off and destroyed. The Chinese commander, Chang Chih-chung, pulled half of 87 Division out of Shanghai to bolster the defense of Wusong and ordered 98 and 11 Divisions to cover Chuanshakou. A fierce battle erupted over the village of Luodien (121.337E 31.415N), but heavy naval gunfire support allowed 11 Division to take the town on 28 August. By this time Chiang had lost confidence in Chang Chih-chung, and ordered Ch'en Ch'eng to take command at Shanghai. Ch'en was one of the most capable Kuomintang generals, but the change of command was unfortunate in its timing, coming at a crucial point in the campaign. Civilian casualties continued to mount, and included the British ambassador to China, Sir Hughe Knatchbull-Hugessen, who was badly wounded when his car was strafed fifty miles out of Shanghai. The Japanese continued to batter their way inland, capturing Wusong fortress on 2 September and Baoshan (121.498E 31.396N) on 5 September. The fall of Baoshan allowed 3 and 11 Divisions to finally link up in a single bridgehead. The next day, elements of 3 Division secured the Japanese golf club at Gongda (121.558E 31.286N) and rapidly converted it to an airfield from which 2 Combined Air Group could operate. 9, 13, and 101 Divisions were ordered to Shanghai. On 11 September the Chinese were forced to pull back, though the retreat was conducted with great skill. The new positions were not strong, since the Chinese were deficient in even the most basic materials for fortification, such as concrete and barbed wire. They were forced to withdraw yet again on 25 September, just as the first elements of the new Japanese divisions sent as reinforcements began to land, and again on 1 October. These withdrawals were conducted skillfully and were not detected by the Japanese until almost complete. The retreat on 1 October was to a strong position anchored by Wusong Creek (121.072E 31.268N), and the Japanese had considerable difficulty breaking through this new line. Their first attempt to cross, on 5 October, was successful in establishing a bridgehead, but this was contained by the Chinese defenders, who made heavier use of their artillery than at any other time in the campaign. Fighting was particularly intense around Ch'enchiahang (Chenjiahang: 121.357E 31.325N), where 173 Division suffered casualties of nearly 70% in its first day on the line. A Japanese diversion in the form of a amphibious feint further up the Yangtze had little discernible effect. However, a counterattack on October 21 suggested by Pai Chung-hsi proved overly ambitious and was anticipated by the Japanese, who easily crushed the counterattacking force. The Japanese brought in two hundred new tanks and another hundred aircraft, but were stymied using them in the close-quarters fighting. However, the Chinese suffered huge casualties in in the defense of the Wusong line and in the failed counterattack. It was clear that the Chinese could not hold their position in northwest Shanghai much longer. Chiang now pinned his hopes to holding some corner of Shanghai long enough to influence the outcome of an international conference scheduled in to begin in Brussels late October. Chiang originally ordered 88 Division broken up into guerrilla bands to hold strong points in the city, but the local commanders changed the plan to leaving a single battalion, 1/524 Regiment, in the heavily constructed Four Banks' Warehouse. This was almost ideal, being a prominent structure near foreign observers in the International Settlement that could be easily fortified. On October 24 the Japanese made their final assault on Shanghai, only to find the Chinese had again pulled out ahead of them, setting fire to Chapei as they withdrew. The frustrated Japanese opened fire instead on civilian refugees attempting to flee across Jessfield Railway Bridge and other escape routes into the International Settlement. The "Lost Battalion" succeeded in drawing international public attention. The Japanese were reluctant to use their air power so close to the International Settlement, but brought in artillery to destroy the Four Banks' Warehouse with close range fire. The Chinese survivors slipped out of the warehouse on the night of 30 October and escaped to the International Settlement and internment by the British. The Japanese continued to push the Chinese back from Shanghai, attacking at Nanhsiang (Nanxianzhen: 121.323E 31.294N) on October 28, then crossing Suchow Creek on 31 October, but meeting continuing fierce resistance. However, the Japanese had activated 10 Army on 9 October, consisting of 6, 19, 114, and a brigade from 5 Division. In the early hours of 5 November, 10 Army landed at Hangchow Bay, which the Chinese had assumed was unsuitable for amphibious assault because of its large tidal flats and hinterland crossed by numerous streams. The Chinese reaction was slow, due to a belief that the landings were only a diversion. 67 Division was deployed against the Japanese advance but disintegrated after its commander, Wu Keren, was assassinated by a group of men in civilian clothing. Resistance by scattered elements of 63 Division was negligible except at Sheshan (121.230N 31.104E), and this was quickly overcome. The advance by 10 Army threatened envelopment of the Chinese forces in Shanghai. Chinese morale was already close to the breaking point, but Chiang refused to authorize a retreat until 8 November 1937. The Chinese retreat disintegrated into a rout, and it proved impossible to regain command and control. Japanese forces completed mopping up of the Nenshi quarter of Shanghai on 11 November. The Chinese troops around Shanghai had fought tenaciously, astonishing foreign observers in the Settlement. However, air superiority hindered Chinese movements and mostly restricted Chinese artillery support to a few minutes' firing each dusk, lest the guns be spotted from the air and destroyed by counterbattery fire. The battle for Shanghai destroyed the best German-trained Nationalist Chinese formations, leaving the Japanese virtually an open road up the Yangtze valley. On the other hand, troops from virtually every part of China participated in the battle before it was over, building the sense of Chinese nationhood. Total casualties were high for both sides, as many as 200,000 Chinese (including 10,000 of the German-trained officers), with 11,072 Japanese dead and another 31.130 wounded. Shanghai became a major Japanese base, supporting the drive to Nanking and beyond. If Chiang expected foreign intervention against Japan, he was mostly disappointed. Only Russia changed its diplomatic stance, signing a non-aggression pact with China on 29 August 1947. During the Pacific War. Scattered guerrilla activity continued around Shanghai, and in response the Japanese fortified Wusong as a secure base of operations outside the city. Following the Japanese occupation of the Chinese portions of Shanghai, the Japanese Army brought increasing pressure against the Settlement. In mid-August 1939 a clash between a British patrol and the puppet Chinese police prompted the Japanese Army to land 6000 troops to blockade the settlement. This coincided with the German-Soviet Pact, which caused the Japanese to postpone the blockade; the British took this opportunity to withdraw. The Americans urged the British to stand firm, but were themselves unprepared to risk war with Japan. As a result, a joint Anglo-American-French stand failed to materialize and both the British and French withdrew their troops and gunboats from China. 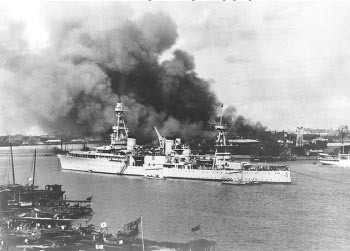 The city was headquarters for 13 Army and China Area Fleet when war broke out in the Pacific, and the Japanese seized the International Settlement immediately following the attack on Pearl Harbor. The city remained under Japanese control for the duration of the war.